What began as a seemingly routine government intervention into a small number of failing banks has grown into a corruption scandal in Venezuela which has claimed the political career of one of President Hugo Chavez's most trusted aides. When Jesse Chacon, the Science and Technology Minister, handed in his resignation to Mr Chavez on Sunday after his brother, Arne Chacon, was arrested over the banking scandal, it must have sent shockwaves through the upper echelons of the Venezuelan government. After all, Jesse Chacon had been a close ally to Hugo Chavez for almost 20 years, even going to prison with him for taking part in a failed coup in 1992. Many Venezuelans were left wondering if a man like Mr Chacon was to leave government over the affair, who else could be involved? First it is worth rewinding a little to explain how this situation arose. On 20 November, the government took over four banks, including Banco Canarias and ProVivienda, which were accused of providing loans to companies in which the banks' directors were major shareholders. As the questions began to mount up, one man emerged as key: a hitherto unknown businessman called Ricardo Fernandez Barrueco. Mr Fernandez had amassed a fortune through supplying food to the government's subsidized supermarkets. He led a group of investors in buying Banco Canarias allegedly using depositors' funds and public money. Mr Fernandez is currently under arrest and awaiting trial, as is his lawyer and his lawyer's daughter, who are accused of facilitating the illegal transactions. 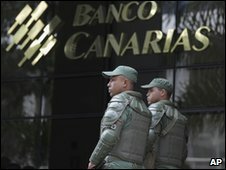 As Banco Canarias customers began to queue outside the branches to withdrawal their savings, the investigation then widened. Three more banks passed into state hands for similar irregularities. One of them was the development bank, Banco Real. Its president was Arne Chacon, brother of the Science and Technology minister, Jesse. 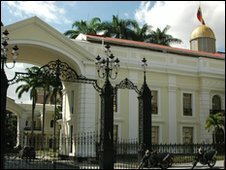 The opposition parties say the whole tangled web of associations, family relationships and apparent white collar crime reveals something they have claimed for some time: that a culture of cronyism, known as the "Boli-burgesia", exists in the heart of the Chavez government. "The 'Boli-burgesia' is a summary of two words: bourgeoisie and Bolivarian," says Teodoro Petkoff, newspaper editor and vocal critic of President Chavez. "It refers to a rich elite created through corruption, through illegal links with the Bolivarian government of Hugo Chavez. "It's a word we Venezuelans have invented to mean a corrupt businessman linked to this government." For Mr Petkoff, Ricardo Fernandez and the ex-minister's brother, Arne Chachon, are prime examples of "boli-burgeses". "Ten years ago, Ricardo Fernandez was a modest businessman," says Mr Petkoff. "But through his government contacts, he has obtained a series of contracts with the state which have allowed him to make a great deal of money. "He now owns a transport company, a company producing maize flour for the government-run supermarkets, a flotilla of fishing boats, and four banks. "He's a man who has been transformed into a magnate by his relationship with a supposedly socialist government." Several opposition figures, including Mr Petkoff, have publically said that one of Ricardo Fernandez's main government contacts was President Chavez's own brother, Adan Chavez, who is governor of their home state of Barinas. Adan Chavez denies knowing Mr Fernandez and is not under investigation over the scandal. Either way, most analysts agree that the banking scandal in Venezuela isn't over yet. There are still more than 25 arrest warrants out, on top of the eight bankers already detained. The process of returning the depositors their savings has begun using the recently nationalised Bank of Venezuela as well as a number of private institutions. But what has the episode done to the banking sector in Venezuela in the long term? "The biggest damage has been to confidence," says economist, Jose Guerra. "At first you say you're going to take over four banks, and that the process is going to be open and transparent. "Then a few days later you announce you're taking over three more, but that now it will take place behind closed doors. "What do you expect will happen when you then tell customers to have confidence in the security of their deposits?" People are demanding a great deal of cash as they seek to recoup their savings, Mr Guerra says, something which could hurt the liquidity of the system as a whole. But the real damage of the crisis is probably more political than economic. With elections for the national assembly due next year, it still isn't clear how the scandal could affect President Chavez and his United Socialist Party candidates. The government says they have acted swiftly. 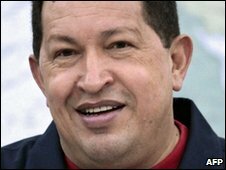 The main culprits have been arrested, President Chavez said on national television, and the worst of the crisis is over. But for former Central Bank economist, Jose Guerra, there are still serious questions to be answered about the way in which the purchase and sale of these banks was carried out using public funds. "How is it possible that three billion dollars of public money was deposited in these banks in just two days?" he asks. "Who are the state officials who allowed such transactions to happen? There must be a group of state officials who knew what was happening."